The King’s Curse, the 6th novel in Philippa Gregory’s Cousin’s War series. Very well done. Recommended. You can tell Philippa Gregory enjoyed writing Margaret of Warwick’s story in The King’s Curse – her 6th novel in the Cousin’s War series. The novel is one of her best, bringing to life one of the great Plantagenet women — one lucky, or canny, enough to survive the Tudor period into old age. And Margaret is a survivor, adept at hiding her true feelings of grief at the loss of family and fortune and shielding her remaining Plantagenet family. She was adept at managing courtly intrigue — and keeping secrets. Secrets like the truth about the marriage of Prince Arthur and Katherine of Aragon, and the truth about the curse cast by her cousin Elizabeth — a curse that affects the Tudor succession. Margaret of Warwick was the daughter of Isabelle Neville (one of the Earl of Warwick (aka Kingmaker’s daughters) George, Duke of Clarence — the brother of Edward IV and Richard III. Even listing Margaret’s famous kin should give you an idea of the tragedies she experienced: her grandfather the Earl of Warwick was beheaded by Edward IV, her father was drowned in a barrel of Malmsey; and her uncle Richard III was slain on Bosworth field by a victorious Henry VII who eventually executed her brother Edward of Warwick, several cousins, and her eldest son. The book has several telling family trees that show the Plantagenet’s at the start of Henry VII’s reign and those surviving at the end of Henry VIII. This was definitely one of my favorite novels in the Cousins’s War. The first-person narration brings into Margaret’s thoughts, fears and hopes, triumphs and tragedies. Through Margaret, you understand what it was like to be a Plantagenet in the aftermath of the Tudor victory, on the losing end the War of the Roses and at the mercy of Henry VII and Henry VIII. Margaret herself was favored by Henry VII — enough that she and her husband attended Prince Arthur and Katherine of Aragon at Ludlow. 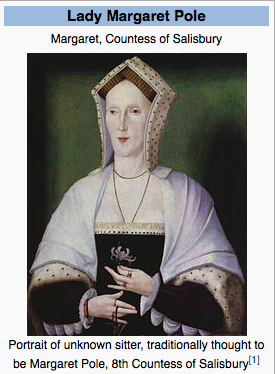 But her fortunes — and those of her family—fall afterwards while Henry VII reigns. Margaret thinks and hopes that Henry VIII — the son of her good friend and cousin Elizabeth of York — will be a good, merciful King in the style of the Plantagenets. Her fortune rises again as she waits upon Queen Katherine, eventually becoming governess to Princess Mary, is named a Countess in her own right and becomes one of the richest people in England. But Henry is not the King she hoped for and as any student of history knows, so many of those close to Henry VIII found themselves in the Tower awaiting execution. Margaret’s execution is one of the low points of Henry’s reign, still shocking ~450 years later. Henry VIII character arc is one of the novels strengths, for me. I loved the way Gregory portrayed his descent from the good-looking, most-favored ruler in Christendom to the obese, distrusting, vengeful tyrant he became. His failures as a monarch lead Margaret to act on the hope for a new rule — Princess Mary — and in that lies her doom. Gregory does an excellent job of showing the impact of the Dissolution of the Monasteries on the people of England, who lost their long-held traditions as Reformation swept the nobility. I appreciated that this novel was consistent with others — “The Constant Princess” “The Boleyn Inheritance” and the others in the series in terms of character histories. 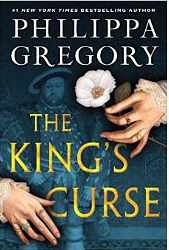 Here are links to my reviews of other Gregory novels — I did not review all of them, but read them all and think for the most part they were well done (“The Red Queen” being my least favorite and “The White Princess” one of my favorites). This entry was posted in Book Review, Fiction, Historical Fiction, Plantagenets, Tudors and tagged beheadings, Countess of Salisbury, Henry VII, Philippa Gregory, Plantagenet, war of the roses. Hi there! In general I did enjoy them…I was less a fan of the Red Queen and Lady of the Rivers, but then I think some of that had to do with the subjects. But yes, I did particularly like the White Princess and this one. Perhaps I knew less about them going in? In general are you enjoying these? I was a great fan of hers, but the last few I read felt more like she was just churning them out.